88% Nylon, 12% Elastane. The definitions below is how we try and describe each item. I always list all defects and put a picture. Nanette Lepore Tribal Beat Goddess One-Piece Swimsuit. Swimsuit features colorful tribal-inspired prints. Moderate rear coverage. Adjustable, removable strap at middle back. Hand wash, line dry. Color: black, multi color beads. I will gladly answer as soon as I can. I always list all defects and put a picture. Nylon/elastane; hand wash. Fully lined. I always list all defects and put a picture. Color: black. Tie sides bottom. Allover crochet overlay, fully lined. Strappy low back. Swimsuit with ruched side panels and cutout detail from Nanette Lepore. Oval cutout at center. Full seat coverage. Color: Purple. (Bras ONLY accepted). Varies by Country. One piece swimsuit. V Wire front. Removable neck strap. 72% Nylon; 28% Elastane. No defects. No stains. No piling. STYLE: Origami Pleats Goddess One Piece. - Cutout detail. Shell: 78% nylon, 22% Lycra. Plunge neck. We are family run and operated with only the occasional outside help. Hand wash cold, line dry. COLOR: Black. Nanette Lepor. Origami Pleats Solid Bikini. Size Large. Fully lined. ITEM DESCRIPTION Waist across: 16” PLEASE NOTE: All manufacturers have their own sizing standards.We provided Measurement to insure that you get the correct size for you. SHIPPING: We usually ship within 1 business day of receiving cleared payment. COMBINED SHIPPING: We do combined shipping Please contact us, before you pay and we will sent the invoice TRACKING: - All domestic (US) packages includes online tracking number. - International USPS First class mail does not include online tracking. Thank you for your business!! Rock a boho beach look in Nanette Lepore's free-spirited swimsuit, featuring a strappy scoop back and illusion crochet. Inspired by her artsy bohemian childhood and passion for a good party, Nanette's designs are adored by style maker's and celebrities alike. 100% Authentic Nanette Lepore. Size Type: Regular. Style: One-Piece |. Sharp pleats mixed with golden hardware add to the chic sophistication of a triangle bikini top that's sure to make a splash. - Size large. - Ties in back. Nanette Lepore. MAYAN RIVIERA SLIDING TRIANGLE BIKINI TOP. Halter strap, Lightly padded, fully lined. Hand wash with cool water, mild soap, dry in shade. Elegant with an air of mystery, this off the shoulder cover up from Nanette Lepore is richly embroidered at the front for a stunning look. Pullover styling with off the shoulder neckline elastic. Embroidery at front with long sleeves, slits and ties at ends. Nanette Lepore "Goddess" swimsuit in Valley crochet microfiber with contrast lining. About Nanette Lepore Moderate seat coverage. This includes shoes/boots/purses and pretty much everything else. Nanette Lepore Tribal Beat Romper. We are family run and operated with only the occasional outside help. Hand wash, dry flat. COLOR: Black. 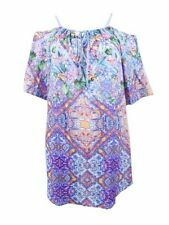 Nanette Lepore sleeveless cover up/romper. Beaded details. One of 4 buttons is missing. Nanette Lepore. Bikini Top. Shiek at the Beach. Nanette Lepore "Goddess" one-piece swimsuit in solid microfiber. Full seat coverage. Nylon/Xtra Life Lycra® spandex. Nylon elastane blend. Brass studds. SEDUCTRESS GODDESS ONE PIECE. Seductress one piece bandeau with lace up front, open strappy back and removable, adjustable strap. Nanette Lepore. Model shows the front and back of the beautiful one piece on! Nanette Lepore Origami Pleats Goddess One Piece Swimsuit Black. Nanette Lepore "Goddess" one-piece swimsuit in solid microfiber. Full seat coverage. Size S Small 4-6. Nylon/Xtra Life Lycra® spandex. Nanette Lepore Origami One-Piece Swimsuit. 78% nylon, 22% Xtra Life Lycra® spandex. Hand wash, dry flat. Color: Black. Nanette Lepore. Style: Calcutta. Seafoam, a soft green color. Swimsuit Cover-Up. Color: Turquoise Blue. Fully lined padded top ties at neck and at back. Smocked fabric. Origami pleats solid pleated vamp style side tie bikini bottom swimsuit pant. Condition Definitions The definitions below is how we try and describe each item. - Hipster cut - Side strap print - Moderate coverage - Fully lined - Imported Self: 83% nylon, 17% elastane Lining: 84% nylon, 16% elastane Hand wash cold. Nanette Lepore. Vamp Tie Side Bikini Bottom by Nanette Lepore. ORIGAMI PLEAT TIE SIE VAMP BOTTOM. Nylon, spandex. Hand wash.
Sheer gauze fabric. Open sides along torso, tie closure. Length: 54”. Side tie bikini swim bottoms with stitched design. Style: Bikini. Bandeau bikini swim top with stitched design. XS 30 1/2 32 1/2 34 1/2. Size XS S M L XL. (Excludes buckle) 35" 37" 39" 42" 44" Girl's Footwear and Slippers. NANETTE LEPORE DAZED EMBROIDERED PULL-ON DENIM ROMPER SWIM COVER UP. Denim romper designed with colorful embroidered lace. Machine wash cold. COLOR : BLUE WASH. Self-tie at back. WAIST : 18"APPROX. Black small swimsuit with multicolored "Mambo" African style printed trim. Hand wash cold, line dry. They have been handled and have been on the racks.